The San Francisco Public Defender’s Office is celebrating its 90th Anniversary, San Francisco Public Defender Jeff Adachi announced. In 1921, the California Legislature passed the Public Defender Act after Clara Foltz, California’s first female lawyer, spent years advocating for the creation of Public Defenders’ offices to provide legal assistance to poor people in criminal law cases. Later in 1921, responding to the Public Defender Act, the San Francisco Board of Supervisors passed an ordinance creating the Office of the Public Defender. San Francisco is unique among the counties of San Francisco in having elected Public Defenders. There have been seven individuals who have served as Public Defender in the 90 years from 1921 to the present: Frank J. Egan, Gerald J. Kenny, Edward Mancuso, Robert Nicco, Jeff Brown, Kimiko Burton, and Jeff Adachi. The San Francisco Board of Supervisors appointed Frank J. Egan as the first Public Defender; his term commenced on October 15, 1921. He was elected to as Public Defender in August of 1922 and served in the position for ten years. Following Frank J. Egan’s removal from office, Gerald J. Kenny was appointed Public Defender in 1932 and subsequently elected. In 1935 the Civil Grand Jury found that “The office of Public Defender, under the direction of Mr. Gerald J. Kenney, has been handled in a most efficient manner.” Kenney served as Public Defender for two decades, dying in office in 1954. Edward Mancuso was appointed in 1954 by Mayor Elmer Robinson to complete Gerald Kenney’s term and the Public Defender began to represent indigent people accused of misdemeanors as well as those accused of felonies. 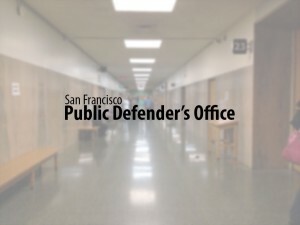 By the time of the Supreme Court’s 1963 decision in Gideon v. Wainwright which clarified the Constitutional mandate for public defenders, San Francisco had already had a Public Defender’s Office for over 40 years. Upon the retirement of Edward Mancuso in 1974, Robert Nicco, who had been Chief Attorney under Mancuso was appointed Public Defender and then elected in November 1974. Under Robert Nicco’s tenure, the office’s diversity was broadened, including the hiring of Estella Wheatley Dooley, the San Francisco Public Defender’s Office’s first African-American female employee, and Fred Smith, an African-American man who was Chief Deputy Attorney from 1974-1979. When Robert Nicco chose not to run for Public Defender, Jeff Brown was elected Public Defender in 1978. Under Jeff Brown’s tenure as Public Defender, after decades of occupying cramped space in the Hall of Justice, the Office moved across Bryant Street into its current location at 555 7th Street in 1987. Jeff Brown resigned from the Public Defender’s Office in 2001 and Kimiko Burton was appointed as Public Defender. In 2002 Jeff Adachi was elected as Public Defender, and following his swearing in as Public Defender in 2003, Jeff Adachi named Teresa Caffese as Chief Attorney, the first woman to serve in that role. Jeff Adachi oversaw the creation of the Office’s Paralegal Unit and Clean Slate Program. In 2005 the Clean Slate Program, of the San Francisco Public Defender’s Office received the Mayor’s Fiscal Advisory Committee’s Managerial Excellence Team Award and in 2006, Clean Slate received the California Public Defender’s Association Program of the Year Award. In 2006 Jeff Adachi received the American Bar Association’s Dorsey Award, honoring an outstanding public defender or legal aid lawyer. In 2007 Jeff Adachi received the California Lawyer of the Year Award. In its 90 years of existence, the San Francisco Public Defender’s Office has enabled countless people to exercise their constitutional right to counsel. The San Francisco Public Defender’s Office will be celebrating its 90th Anniversary with a private event on December 9, 2011. Adachi noted that free legal representation is important because it prevents miscarriages of justice. “The right to legal counsel in this country is a sacred constitutional right, and over the past 90 years, our office has grown from our humble beginnings to a world class team of lawyers, investigators, paralegals, and support staff who work tirelessly to provide high quality representation to those who cannot afford to hire a lawyer,” said Adachi.